Billed as a serial poetry anthology, open year-round to submissions, Volume 1 will give you a hearty meal of U.S. poetry. By my calculation there are eighty-four poets and one hundred and thirteen poems on the menu. The potential problem with such an open and eclectic gathering of verse is often quality, but a quick browse through the ten pages of notes on the contributing poets discloses a creditable writing and publishing record across almost the entire board. With so many juicy titbits to sample, it is difficult for this reviewer to choose which poems to highlight to provide a flavour of the diverse verse on offer. I’ve opted for a semi-random selection, but as the poems are arranged alphabetically by poet I’ve endeavoured to select some from the beginning, middle and end of the anthology so the A,B,Cs don’t get all the glory. With so many forms, styles and tones on offer you are unlikely to enjoy every poem in this eat-all-you-can buffet, but then again there will inevitably be little delicacies to tempt you, whatever your palette. 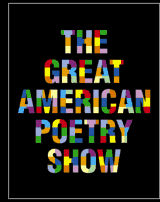 The Great American Poetry Show is edited by Larry Ziman, Madeline Sharples and Nicky Selditz and is published by The Muse Media at The Great American Poetry Show and TGAPS. J.S.Watts lives and writes in the flatlands of East Anglia. Her poetry, short fiction and reviews are published in a variety of magazines and publications in Britain, Canada, Australia and the States including: Ascent Aspirations, Envoi, The Journal, Polluto and The Recusant. Her debut poetry collection "Cats and Other Myths" is published by Lapwing Publications. For further details see J.S. Watts. Hi J.S.---- Thanx for the review of TGAPS #1. How did you get a copy over there in England? Do you have the hardcover or a PDF copy? If you have the PDF, I'll send you the hardcover as a thank you and I'll include the hardcover of TGAPS #2.